Questions About Premedicating with Antibiotics? We Have Answers! 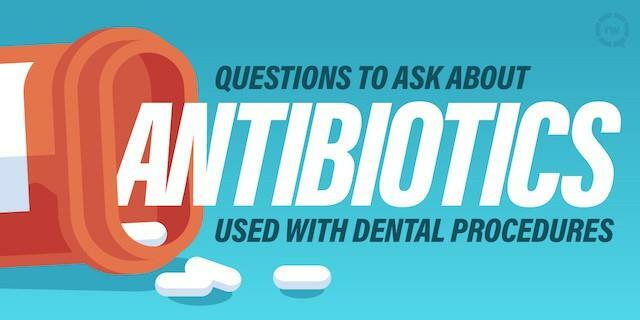 If you’ve been prescribed antibiotics in conjunction with an upcoming dental procedure, you might have a list of questions for your dentist about why. Any time you take antibiotics, it’s important to understand both why you’re taking them and how to take them. Antibiotics are a wonderful tool in modern medicine to prevent and cure bacterial infections. They have saved countless lives. But the overuse (and misuse — when not taken properly) of antibiotics has created antibiotic-resistant strains of bacteria. This means that you could become infected with a form of bacteria that can’t be treated — and that is a scary thought. For that reason, it’s important to use them sparingly and only when necessary. Why do dentists prescribe antibiotics (premedication) for dental procedures? Antibiotics are prescribed alongside dental procedures to prevent bacteremia — a condition in which bacteria enter the bloodstream and spread infection to different parts of the body. Your dentist will take your whole medical history into account to determine if you require premedication. Make sure they are aware of any and all medications you are currently taking or have taken recently. For instance, if you’ve recently taken antibiotics for strep throat, it’s important that your dentist know this. That way they can prescribe a different type of antibiotic. Your dentist may also need to consult with other physicians you see. This might take some extra time but is worth it! In the past, premedication was recommended for heart murmur, mitral valve prolapse, and artificial joint replacements, but current guidelines exclude these conditions. Typically, your dentist will write you a prescription. You will pick it up from your pharmacy and take it 30 minutes prior to your appointment. If you have trouble taking pills orally, your dentist may administer antibiotics while you’re in the chair (via intramuscular injection or intravenously). Note: it is extremely important to take your antibiotics exactly as they are prescribed. This helps prevent drug-resistant bacteria from developing. What happens if you forget to premedicate? Let your dentist know if you have forgotten to premedicate. In most instances, you may still take your antibiotics within two hours of the procedure. Are there any potential side effects of premedication? Yes. Any medication has the potential to produce side effects. These could include nausea, upset stomach, allergic reactions, and others. However, there are also risks to not premedicating, including bacteremia and sepsis. This is why you have been prescribed premedication. Ask your dental team! If you are hesitant about any part of your health plan, it’s best to speak up and gain clarity! Your dentist should be up to date on current guidelines set in place by the American Dental Association and the American Heart Association, and will know the ins and outs of your individual situation (as long as you’ve told them everything!). Best of luck!